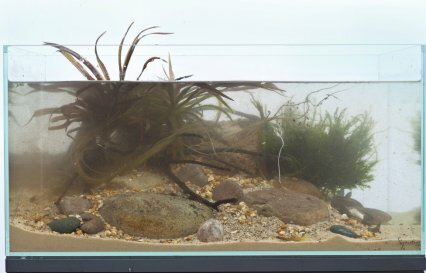 Mighty Blighty: Set up a tank for Sticklebacks! 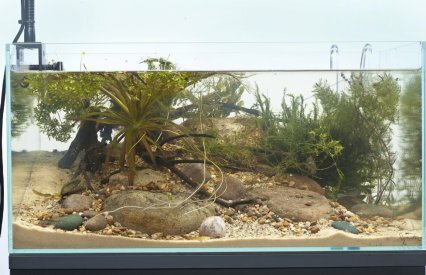 Patriotic Nathan Hill goes native for his latest step-by-step aquarium project and salutes the best of British waterlife. It’s a jungle out there. Snarling, lip-curled predators lurk in dense mats of underwater foliage, seeking out alien-looking crustaceans. Dip in to the waters and you might unsettle a writhing leech or plunge a toe into a tangle of mollusc eggs. This is the wilderness that can be found in any UK stream or pond. Many things about our islands are seasonal. Recipes come and go according to changing weather. Gardens bloom and decline. And the same applies to what’s available in our aquatic stores. Many retailers gear up with the varieties of greenery and fish they can only sell for only a short window of the year. We say let’s grab these seasonal fish when they present themselves! The typical Brit aquarist is only fond of fish from remote, tropical extremes of the globe, but it’s high time we took our native fishes more seriously, and that’s what we’ve chosen to do here. Actually that’s not strictly true. Our initial plans for this set-up involved imitating a Burmese lake. 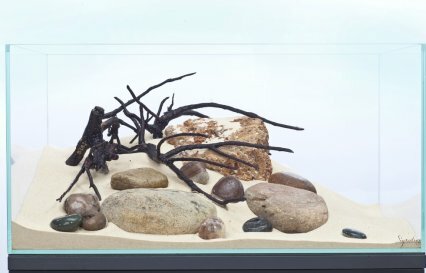 We had in mind a Barb-filled, slightly sub-tropical set-up replete with mud and tangles of Elodea. We’d even started buying in bits to turn those plans into reality. Then a PFK delegation chanced upon the Nottingham Aquatic Centre — and all that went out of the window. Within minutes we’d spied plump Sticklebacks (Gasterosteus aculeatus) and a further recce revealed pond plants in full swing outdoors. We chewed the idea over with the store’s owner and manager Guy Stephenson and, being even more enthusiastic than ourselves, he sold us on the all-native concept in a matter of seconds. His vats were heaving with vibrant, native plants and as an added bonus they were also brimming with worms, crustaceans, leeches and so much more. All systems go then! We would prepare the hardware and he would source us the plants, fish and miscellaneous wrigglers. The concept of a native tank is not new and there are many around the UK. We probably all have fond memories of school tanks, filled with bobbing Daphnia, and tiny larval fish. However, there’s nothing juvenile about revisiting those days with a tank that pays homage to our indigenous wonders. logical approach for utilising plants that break the water’s surface and flower, adding to our illusion of a waterside British summertime. 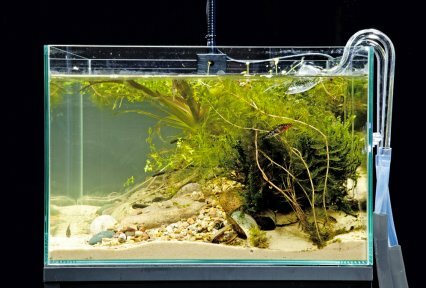 Besides, who’s to say we can’t have a stab at an aquascape that’s less Japanese and more Blighty, just for once? The beauty of this tank is that, compared to some, it’s cheap. Sticklebacks are modestly priced and potted pond plants can be excellent value for money. A £4 pond plant can often be the equivalent of as many as three or four £3.50 aquarium pots. Many species don’t often crop up in tropical selections either — like floating Water soldiers. The priciest parts of our tank were the glassware and cabinet, lighting and filtration. Everything else involved mere pennies. The Signature tank and cabinet will set you back around £239.98, and the Kessil A150W LED light another £230. For filtration we’ve used a Fluval 306 external canister retailing for £134.99. Given that it’s a native set-up, we don’t even need a heater! You can chop and change as you see fit. Want to use a T5 tube? Fine, the plants won’t mind. 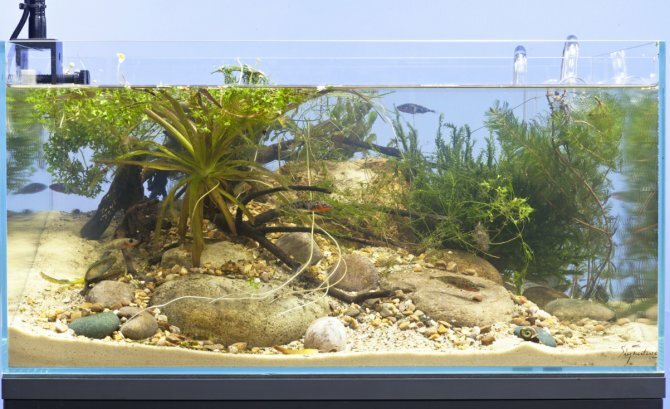 Want to use a second-hand glass aquarium? No bother, go right ahead. 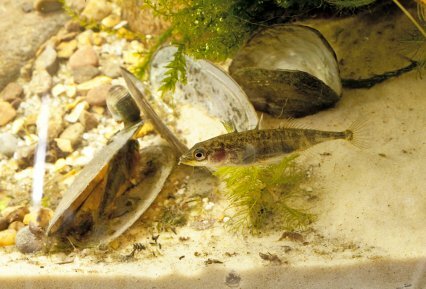 Sticklebacks don’t need a great deal of room, so any 60cm/24” area for a small group will work. If you happen to have a small internal canister filter floating around that’ll make a fine alternative to an external. We were only using all this gear as we wanted to push the boat out! We used half a 25kg sack of silver sand, which equates to about £4 or £5. On top of that we sprinkled gravel, mostly from the pots the pond plants came in, so that cost nothing. A few small pieces of Sumatran driftwood will cost you £10 to £15 maximum and the rounded cobbles we used to bulk up the back can be picked up from a garden centre for a pittance. For plants, although we took a large selection we ended up using some loose Ranunculus fluitans, a pond pot of Eleocharis acicularis, one large pot of Fontinalis antipyretica, a single Water soldier (Stratiotes aloides) and some loose Stonewort (Chara) that’s actually a type of algae rather than a plant. Astute readers will even spot a little Myriophyllum at one edge of the tank photograph, along with a few floating and sub-surface duckweed types. Livestock was equally cheap, but just as exciting as any tropical shrimp and tetra combination. We opted for six Three-spined sticklebacks, comprising four brighter males and two silvery females. Given time these easily-spawned fish, distant relations of the Seahorse and the Sea moths, will happily start to nest and breed. Ours quickly showed signs of doing so! We added a handful of Ramshorn and Stagnalis snails, both of which got right at home. Nottingham Aquatic Centre even went the extra mile for us. When we returned to collect the livestock the staff had rummaged around in their pond filters to get together a bag full of wriggling Asellus and Gammarus crustaceans. These detritivores clean up some debris in the tank, as well as acting as a constant food source for the ravenous Sticklebacks in much the same way as marine copepods are used in reef tanks. Ask your retailer nicely and it’s likely he or she will happily collect a few for your coldwater set-up from one of their pond displays. For the finishing touches the guys at Nottingham even rustled up a few tiny, non-aggressive leeches for us, as well as some Tubifex to sit buried among the sand. Alongside a handful of Glassworms, these completed the feel of what we hope you will agree is one very domestic, British Isles display. Three-spined sticklebacks represent the largest species in the Stickleback family – at just 5cm/2" fully grown! However, there are variations within the aculeatus complex, and some anadromous types (facultative brackish and seawater dwelling) can reach 11cm/4.5". They tolerate a moderate range of conditions, but are susceptible to tanks that are too warm. Like many native fish, they will happily live in water down to 4°C/39°F, but above 20°C/68°F they suffer, their metabolisms increasing considerably. In most unheated tanks of 18°C/ 64°F or under, they will do just fine. They prefer water to be slightly alkaline when in freshwater, though acidic populations cope without repercussions. Extremes aside, hardness and exact pH values are not critical. They prefer to live over mud or sand and though plants add to offer effect they are not essential. Sticklebacks are among the fiercest kind of carnivore and in the UK play a superb role in helping to control midge larvae — their food of choice. All kinds of meaty foods will be taken in the aquarium. When our own left their transport bag they immediately tucked in to some stray Asellus! Spawning these fish is simple and breeding time is the only period when these fish don’t prefer to be in shoals. The male makes a nest in a crater he has dug and amasses plant debris which he spins into a tube, using excretions from his body. He’ll then invite a female across to lay eggs before chasing her off. The eggs hatch after around eight days at room temperature, at which point the fry can be fed on rotifers, Artemia nauplii, and liquid or powdered dry foods. A few days after that the male will stop caring for them and rebuild his nest for a second attempt at mating! 1. The tank is cleaned thoroughly and placed on the base mat. Two large lava rock pieces are used to bulk the rear while the display cobbles are positioned forward. 2. Around 12kg/26lb of pre-washed silver sand is added, piled high in the rear left-hand corner. This will allow surface-breaking plants like Ranunculus to set down roots. 3. 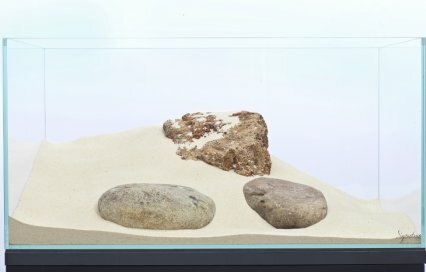 Four small pieces of Sumatran driftwood from Unipac are added to the high area, banking toward the centre, and smaller cobbles are scattered between gaps. 4. The tank is carefully filled and two smaller grades of gravel, fine and coarse, are scattered between the cobbled areas. Around three large handfuls of each are used. 5. The Fontinalis is planted at one end and Hairgrass at the rear, breaking the surface. Two Water soldiers are added, one later being removed as it imposed too much. 6. The remaining plants are fitted to the gaps and the lighting and pre-matured filtration installed underneath. Livestock is added and the tank is complete! Use an old tank, an internal and a T5, and you could easily do something similar for a paltry £167.88! This tank would not have been possible without the help, fervour and infectious excitement of Guy, Helen, and all at The Nottingham Aquatic Centre. If interested in a tank like this, I strongly recommend you pay them a visit. We got everything we needed, both at short notice and with minimal planning.